Burial* He was buried in Oakwood Cemetery, Norfolk County, Ontario, Canada. 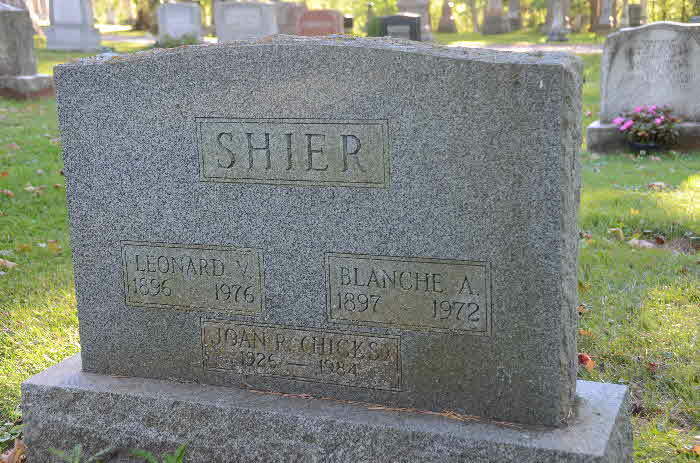 Address* Kenneth Earl Shier lived at Cedar Vale Cemetery, BROCK TWP., Ontario County, Ontario, Canada. 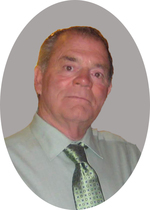 Death* Kenneth Joseph Shier died on 26 February 2018 in Estevan, Saskatchewan, Canada, at age 71; Ken passed away peacefully with family by his side on Monday, February 26, 2018 at St. Joseph’s Hospital, Estevan, SK at the age of 71 years. 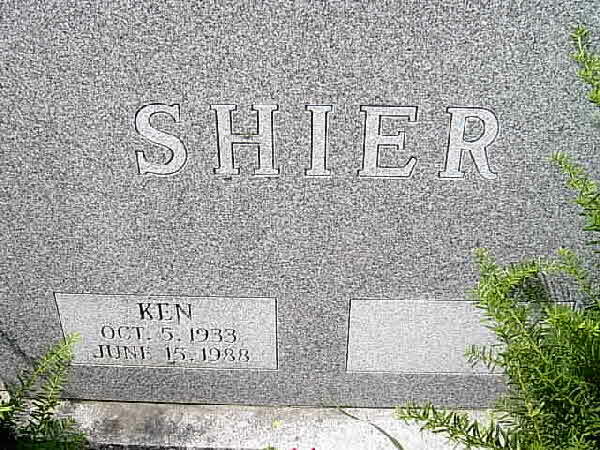 Ken’s memory will forever be cherished by his wife Bonnie; son Mark and his children, Chae-Lyn (Brandon), Bradyn and Kelsey; daughter Tracy (David) and their children Zachary and Josephine; siblings, Paul (Marie) Shier, Mary (Kelly) Brock, Patrick (Debbie) Shier and Jackie (John) Boettcher; sister in law Marlene Shier; brother in law Ron Smart as well as numerous nieces and nephews and great nieces and nephews. 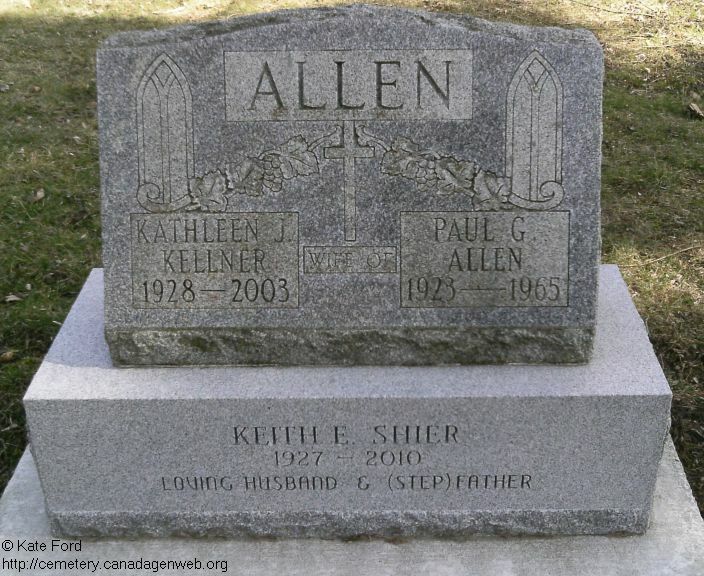 Ken was predeceased by his parents, Ralph and Jeanne Shier; sister Carol (Louis) Stefura; and their son (nephew) Ronald; brother Bernard Shier; parents in law, Lawrence and Elizabeth Crozier; sisters in law, Anne (Clive) Ballam, Joan (Dale) Wollin and Esther Smart. The Memorial Service will be held on Friday, March 2, 2018 at 11:00 a.m. at the Chapel of Hall Funeral Services, Estevan, with Sandy Dalziel officiating. The lunch reception will take place at the Royal Canadian Legion (small hall), Estevan. The private family interment will take place at the Estevan City Cemetery. If friends so desire, memorial donations may be made to the Saskatchewan Cancer Agency (designate to Allan Blair Cancer Centre), 200 - 4545 Parliament Avenue, Regina, SK, S4W 0G3. Burial* He was buried in Eden Church Cemetery, Victoria County, Ontario, Canada. 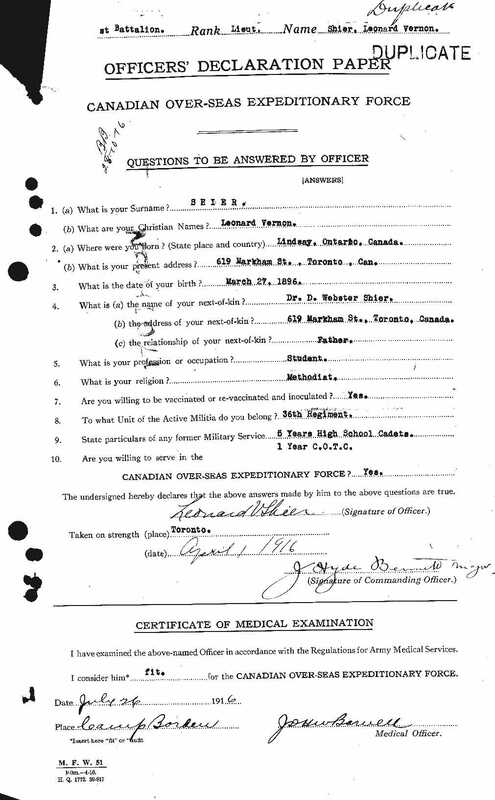 [S22] Unknown compiler address, Saskatchewan Vital Statistics, unknown repository, unknown repository address, Birth Registration for Kenneth Miller Shier #8555. 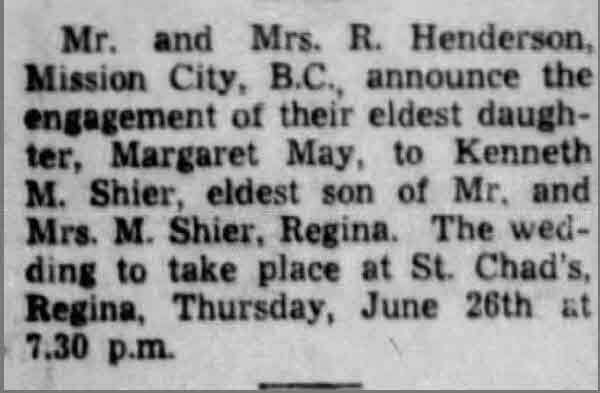 Marriage* Kenneth Milton Shier married Margaret May Henderson on 26 June 1947 in St. Chad's Church, Regina, Saskatchewan, Canada. Death* Kenneth Milton Shier died on 27 January 2004 at age 93; Kenneth Milton Shier Passed away peacefully January 27, 2004 at the age of 93. 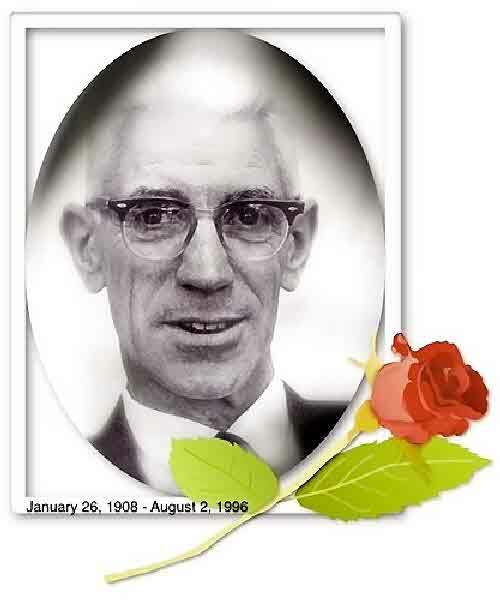 He was born September 29, 1910 in Weyburn Saskatchewan, Canada and immigrated to the United States in 1965. 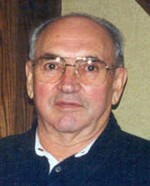 Ken worked for the United Brotherhood of Carpenters Union Local 152 until he retired. 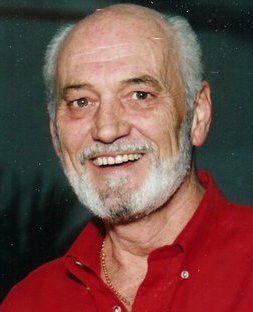 He is survived by his loving children, daughter Patti-Lynn Sekora of Concord and son Kenneth Neil Shier of Milton, Ontario, grandson Sterling Caban of Concord, granddaughter Kimberly Nicole Shier of Oakville, Ontario Canada, son-in-law Richard Sekora of Concord, California, sisters, Evelyn, Rose and Berdie and numerous nieces and nephews. Private Services. 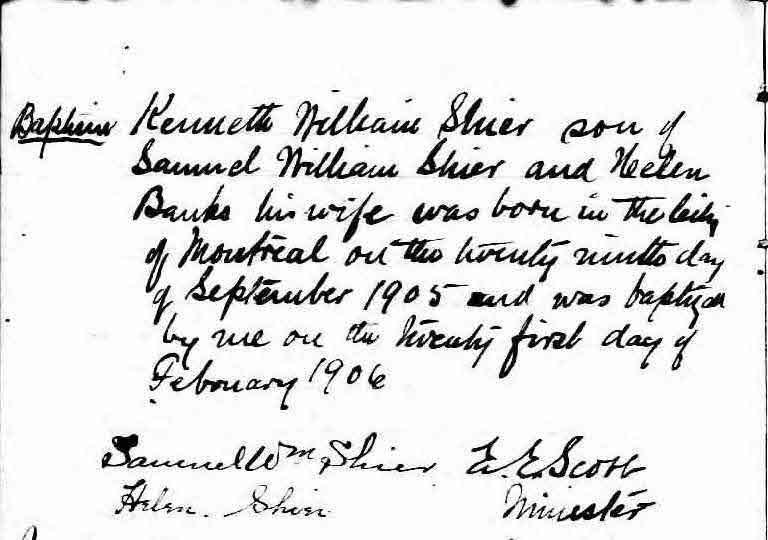 [S46] Drouin Collection, online \, Birth Registration of Kenneth William Shier. 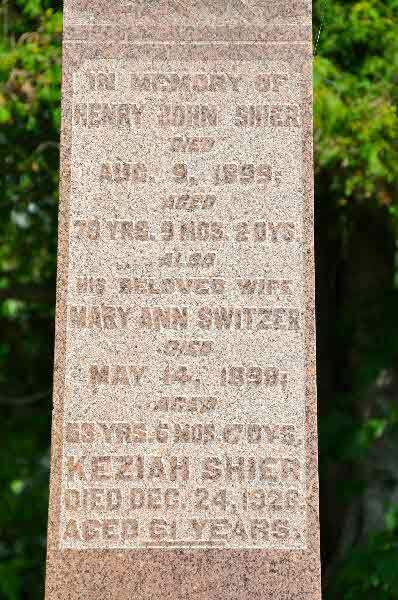 Death* Keziah Shier died on 24 December 1928 in Kew Beach Hospital, Toronto, York County, Ontario, Canada, at age 60. 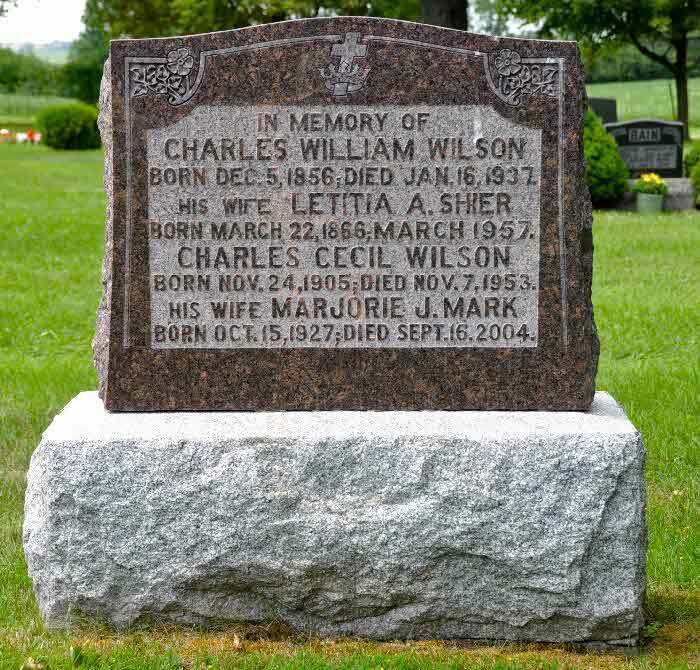 Burial* He was buried on 26 December 1928 in Bagshaw Cemetery, Brock Twp, Ontario County, Ontario, Canada. 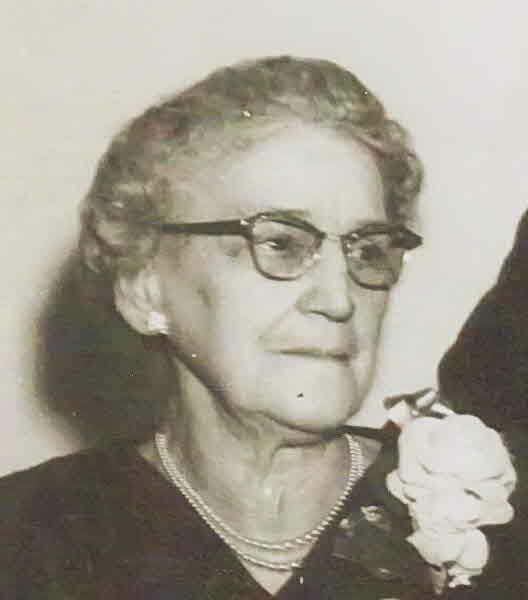 Birth* Laura (Almeda) Shier was born on 24 January 1875 in Brock Twp., Vallentyne, Ontario County, Ontario, Canada. 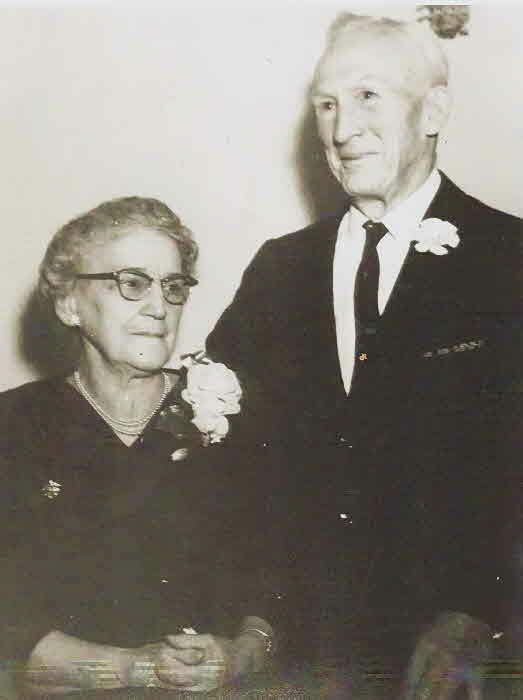 Marriage* She married Lloyd Allen Vansickle, son of William B. Vansickle and Gertrude Foster, on 4 July 1937 in Sault Ste Marie, Chippewa County, Michigan, United States. 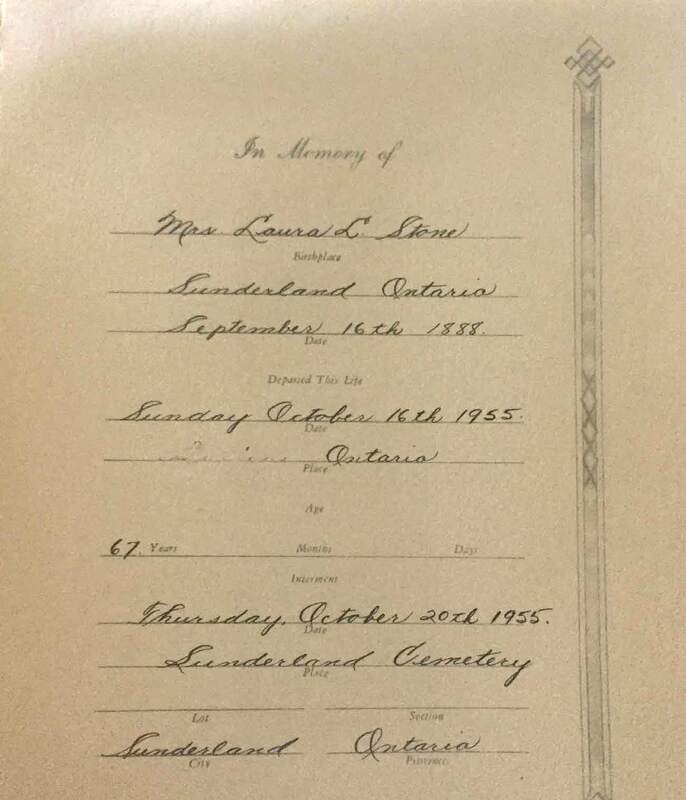 Marriage* Laura Luella Shier married Edley Stone on 1 June 1910 in Brock Twp., Sunderland, Ontario County, Ontario, Canada. Burial* She was buried in Brock Twp., Sunderland Cemetery, Sunderland, Ontario County, Ontario, Canada. 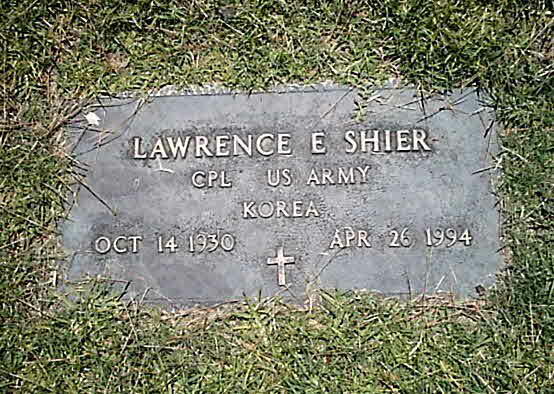 Death* Lawrence Everett Shier died on 26 April 1994 in Orange County, California, United States, at age 63. Burial* He was buried on 3 May 1994 in Rose Hills Memorial Park, Veterans Section, Whittier, California, United States. 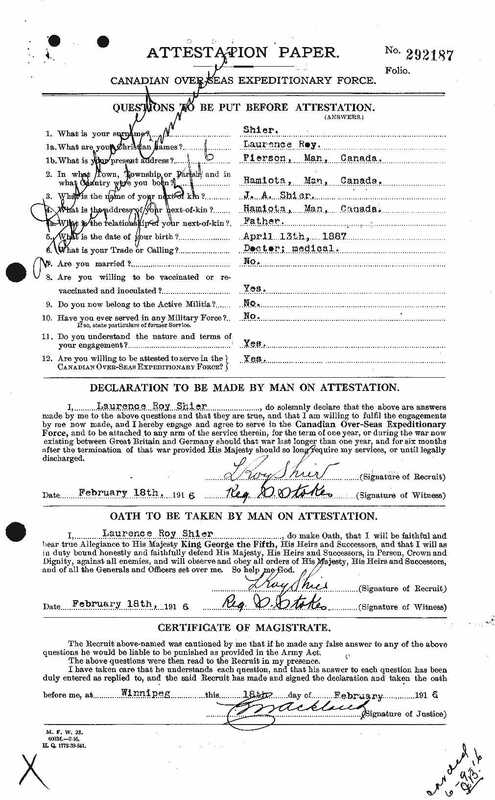 Milit-Beg* Dr. Lawrence Roy Shier began military service on 18 February 1916 in Winnipeg, Manitoba, Canada, medical doctor, Canadian Overeseas Expeditionary Force. 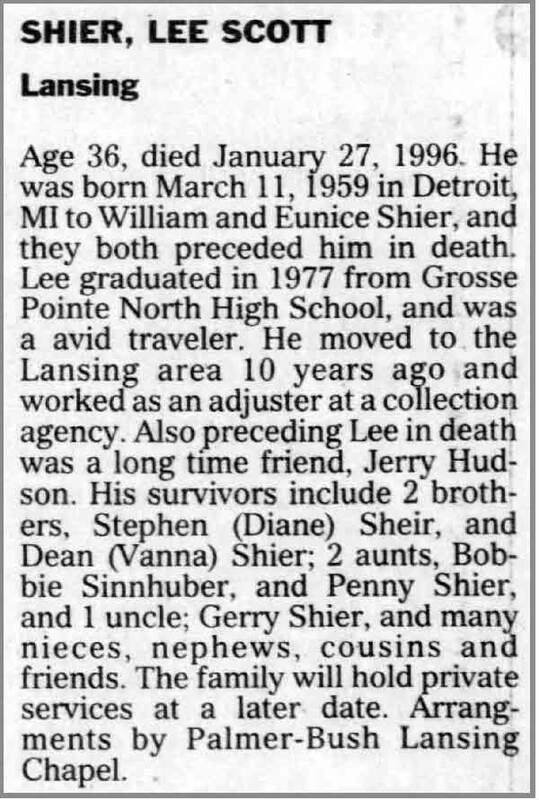 Death* Lee Scott Shier died on 27 January 1996 in Lansing, Ingham County, Michigan, United States, at age 36. 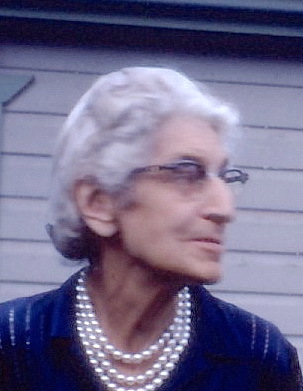 Birth* Lenora Pearl Shier was born on 12 December 1892 in Toronto, York County, Ontario, Canada. 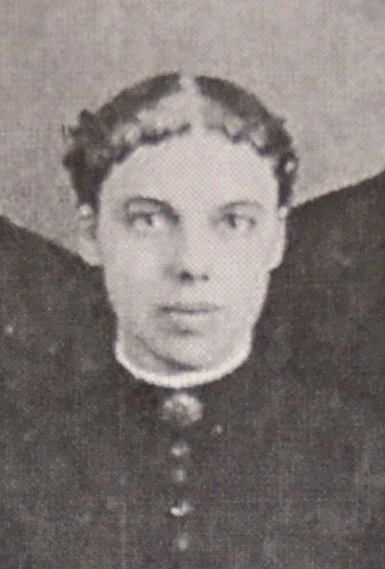 Death* Lenora Pearl Shier died on 29 January 1893 in Georgina Twp, York County, Ontario, Canada; Died at six weeks of age. 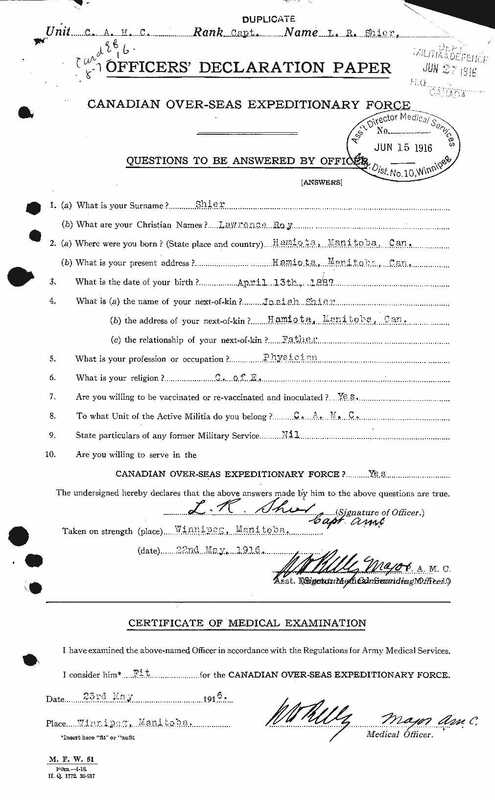 Milit-Beg* Dr. Leonard Vernon Alexander Shier began military service on 26 July 1916 in Camp Borden, Simcoe County, Ontario, Canada. Fact 1 Dr. L.V. 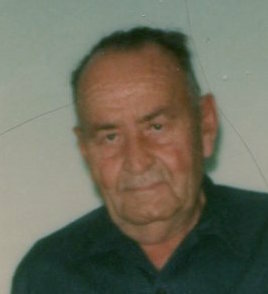 Shier, whose home is at 215 Kent Street W., Lindsay, volunteered for service with the Canadian Army in World War II and entered the RCAMC on 22 October 1940. He held the rank of Captain and served at Lindsay, Ottawa, St. John (NB), Niagara District, Edmonton (AB), Rideau Medical Hospital (Ottawa), and Kingston. Capt. L.V. 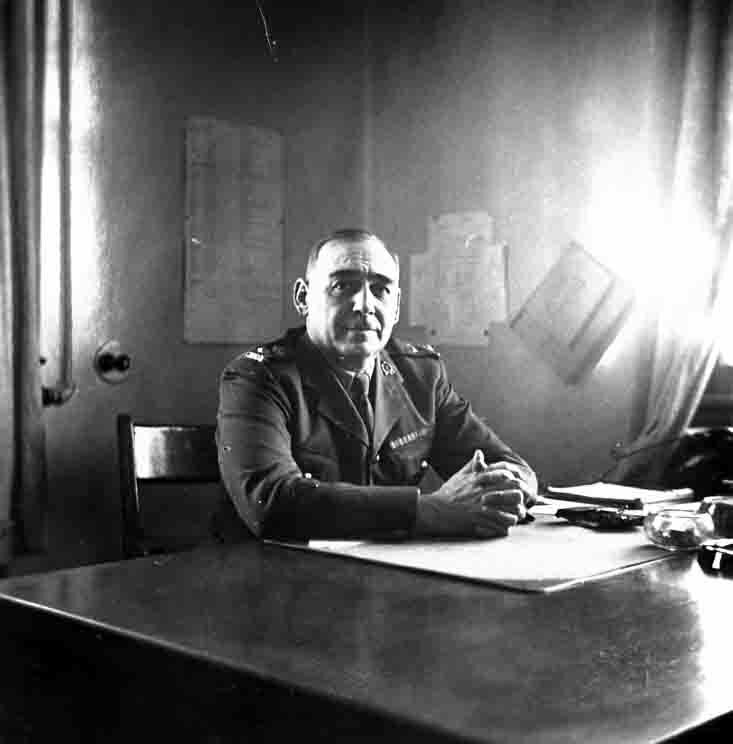 Shier was promoted in the service to the rank of Major, February 1942, and that of Lieut-Col in April 1944. 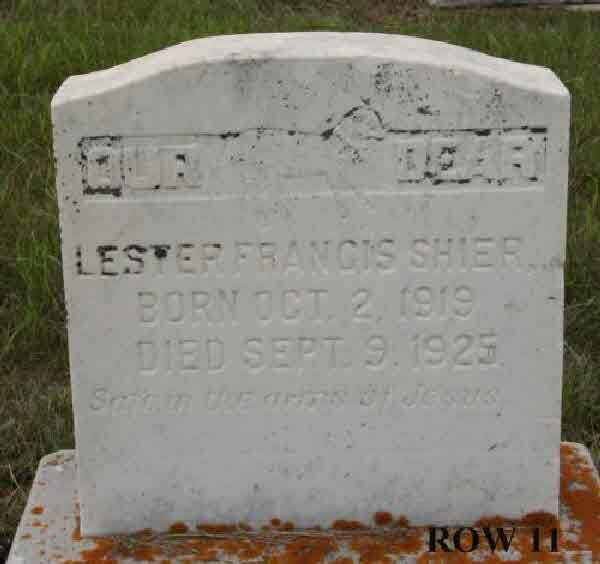 Lt. Col. Shier was privileged to serve only in Canada in World War II but he served overseas in the 1st Great War with the 20th Batt C.E.F. 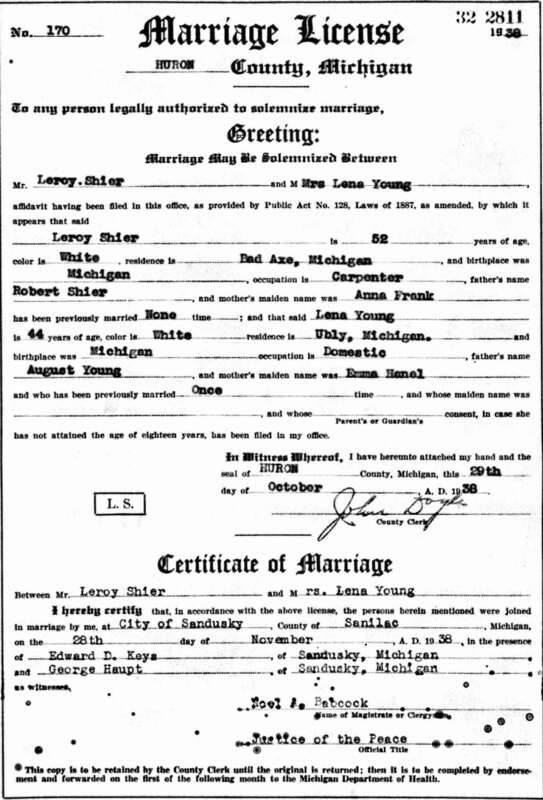 Marriage* Leroy Lehi Shier married Lena Young, daughter of August Young and Emma Hanel, on 28 November 1938 in Sandusky, Sanilac County, Michigan, United States. 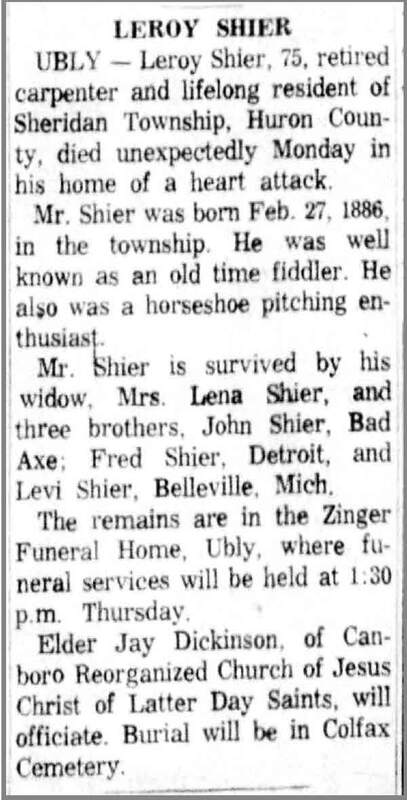 [S42] Michigan Births and Christinings Index 1867 - 1911, online \, Birth Record for Leroy Lehi Shier. [S92] USA, Social Security Death Ind. 1935 - 2014, online \. 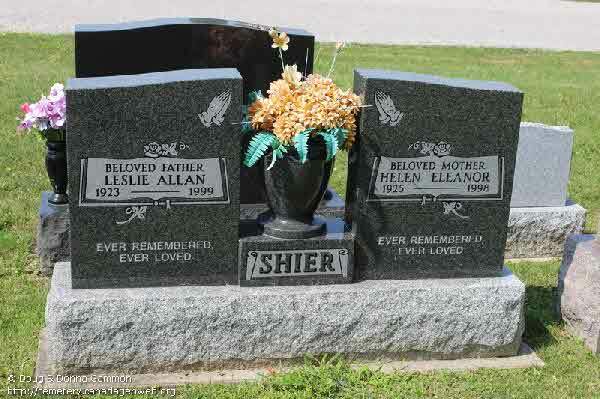 Death* Leslie Allan Shier died on 25 September 1999 in Windsor, Ontario, Canada, at age 76. Burial* He was buried in Windsor Memorial Gardens Cemetery, Windsor, Essex County, Ontario, Canada. 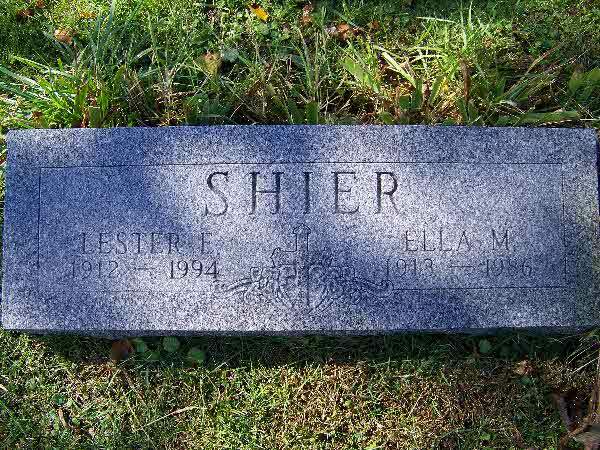 Death* Lester Earl Shier died on 29 March 1994 in Meridian, Ingham County, Michigan, United States, at age 81; Lester Shier, 81, of Fowlerville, formerly of Taylor and Gregory, died May 29 at East Lansing Health care Center. 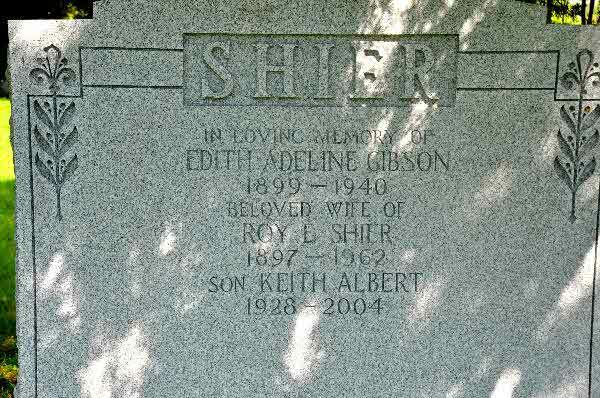 He was born Oct 13,1912 in Detroit, the son of Wayne C. and Nellie May (Estes) Shier. He was married to Ella (Sessions) DeTroyer for almost 30 years and she preceded him in death in 1986. Mr. Shier was a fire marshall for the City of Taylor. 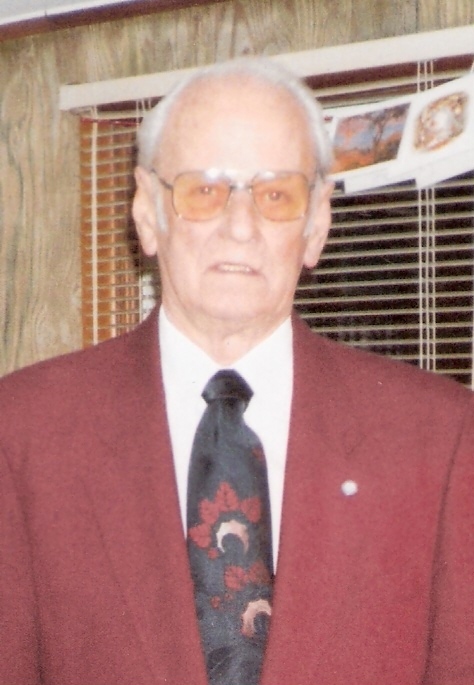 Despite retiring in 1974, he continued to deliver fire prevention speeches in many schools and churches and was active in various fire conventions. 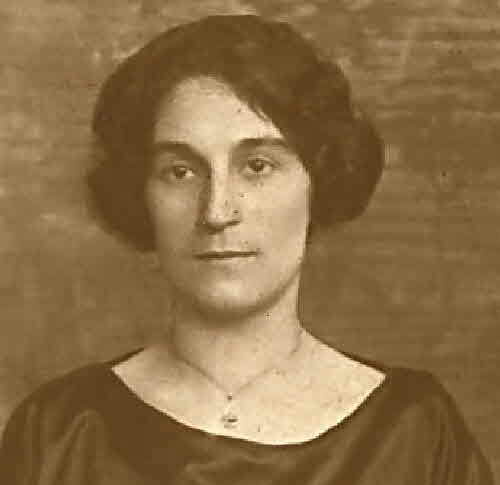 Survivors include two stepchildren; several step-grandchildren; one brother, Junior Shier; one sister, Margaret Zonno; several nieces and nephews. 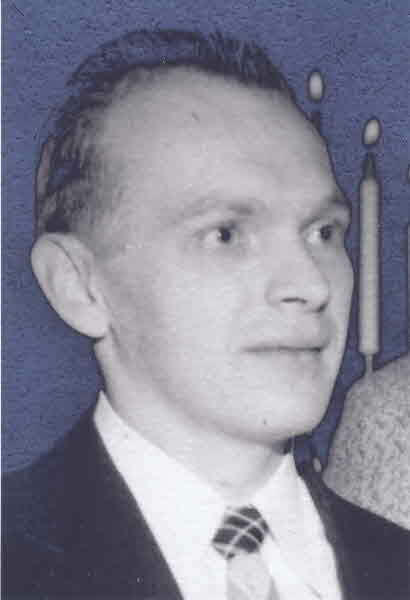 He was preceded in death (by) his first wife, Viola Frost, in 1948. Burial* He was buried on 31 March 1994 in Mount Olivet Cemetery, Detroit, Wayne County, Michigan, United States. 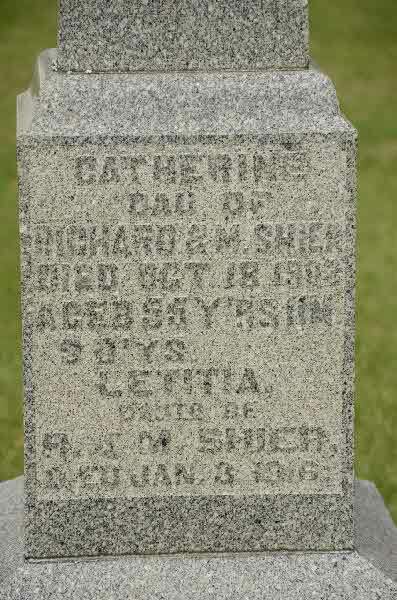 Death* Letitia Shier died on 3 January 1916 in Cannington, Ontario County, Ontario, Canada, at age 59. Burial* She was buried in Necropolis Cemetery, Brock Twp, Ontario County, Ontario, Canada. 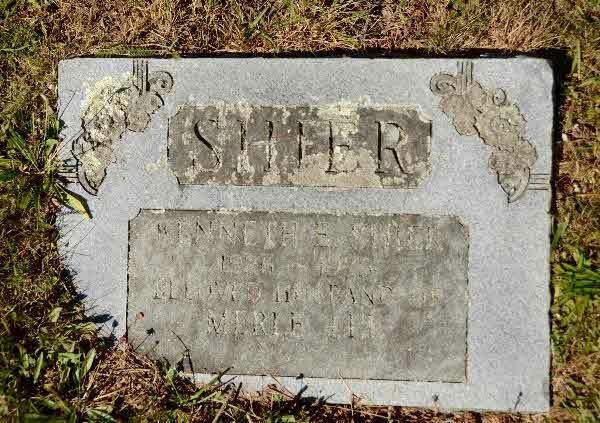 Death* Letitia Shier died on 7 December 1897 in Rathkeale, County Limerick, Munster, Ireland, at age 54. [S80] Ireland, Births and Baptisms, 1620 - 1911, online \. [S81] Unknown title, online \. 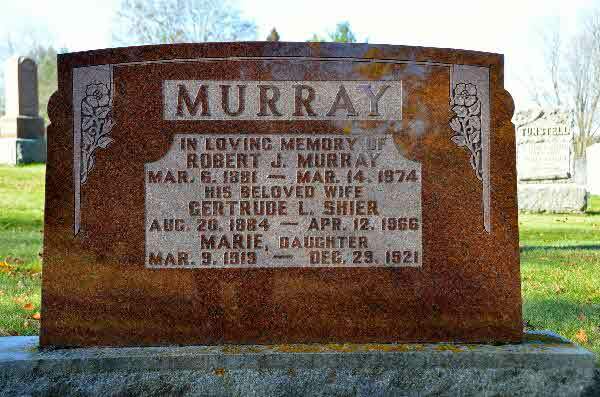 Burial* He was buried in Riverside Cemetery, Plymouth, Wayne County, Michigan, United States. 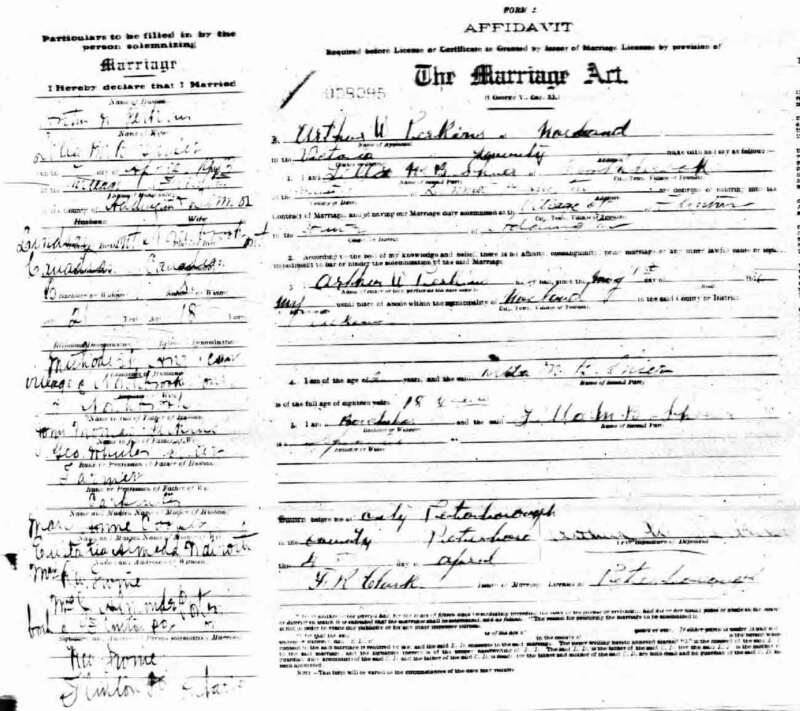 Marriage* Levina Henrietta Gertude (Gerti) Shier married Robert John Murray, son of Joseph Murray and Mary Ann Brown, on 11 January 1911 in Brock Twp, Vallentyne, Ontario County, Ontario, Canada. Fact 1* Wedding Anniversary photo of Gerti Shier and Robert John Murray. 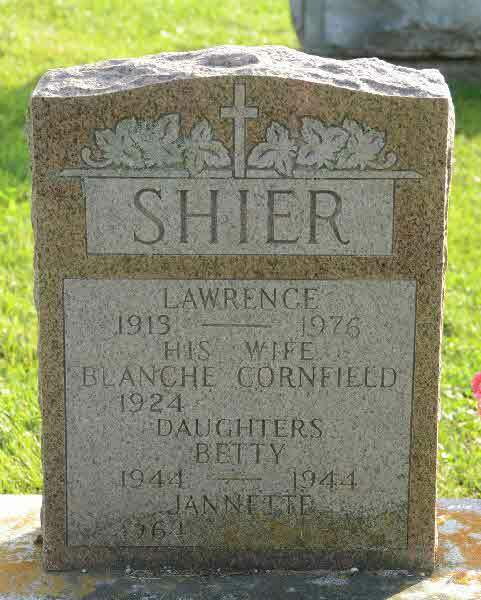 Birth* Lila Florence Shier was born on 27 March 1894 in Georgina Twp., York County, Ontario, Canada. 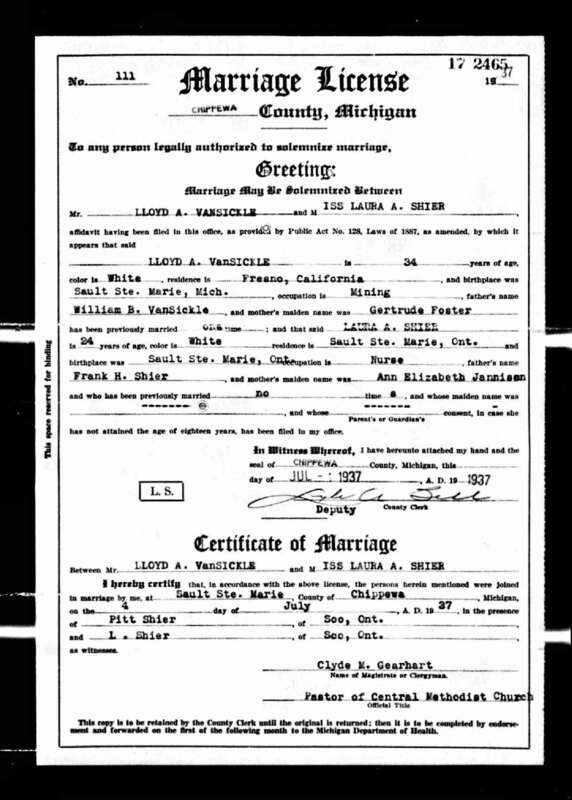 Marriage* Lilla M. B. Shier married Arthur Worel Perkins on 7 April 1913 in Northbrook, Lennox and Addington County, Ontario, Canada.